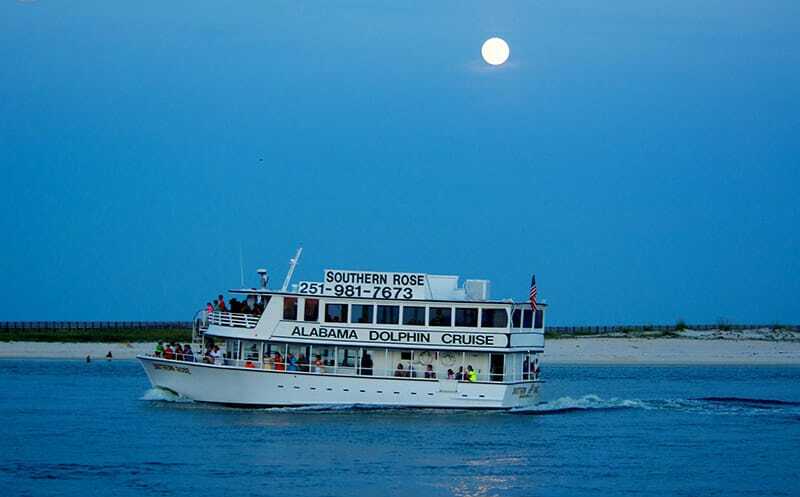 The Southern Rose is a 64 ft long dolphin cruise boat. Amenities include outdoor & indoor seats with air conditioning, 2 restrooms, snack bar and guaranteed dolphins! Get the best view of Orange Beach and the picturesque Gulf of Mexico from 800 feet in the air as you enjoy an Orange Beach parasailing excursion. Southern Rose Parasailing & Dolphin Cruises has offered the best Orange Beach parasail adventures since 2004, with the largest fleet of U.S. Coast Guard approved parasail boats in the region. If you're looking for an unforgettable day at the beach, there's no better place to be than soaring safely and comfortably above it. Our Orange Beach dolphin cruises help you get as close as possible to the playful dolphins that call the Gulf of Mexico home. Travelers who embark on an Orange Beach dolphin tour are guaranteed to see at least one dolphin. In addition to cruising alongside some of the ocean's most majestic creatures, visitors enjoy a 90-minute to two-hour ride on the water, complete with an onboard snack bar serving sandwiches, soft drinks, wine, beer, mixed drinks and other treats for kids and adults. Try the newest extreme sport to hit the water with Flyboard BAMA, the premier Orange Beach flyboarding company. Hop aboard the foot-mounted flyboard and allow the board's jets, controlled by our professional flyboard operator, to propel you up to 30 feet into the air. Experience the adrenaline-pumping sensation of flying right here in Gulf Shores, just 10 minutes down the sand from Orange Beach! We donâ€™t just offer parasailing, dolphin cruises and flyboarding for Orange Beach visitors. Our shop is equipped with everything you need for non-stop fun on the water. Whether you're interested in renting a waverunner, paddleboard, kayak or taking a fun-filled ride on the Banana Boat, we're here to make every day of your Orange Beach vacation a memorable one. Southern Rose Parasailing & Dolphin Cruises is the No. 1 company for your Orange Beach vacation fun. Experience all of the excitement the ocean has to offer in a controlled environment with our highly trained, professional tour guides and water sports enthusiasts. Even better, our tours and adventures are always competitively priced, so you can use us as a one-stop shop for your vacation fun â€” saving you time, money and stress.